Kateys Diary: OMG look what just came through the door. OMG look what just came through the door. I have just realised that Alliance is standing in west Belfast!!! There are no Alliance bill boards up in west Belfast at least to my knowledge, and the first I've heard of a candidate from that party is this morning when a leaflet from the party fell through the mail slot and on to the mat in the hall. 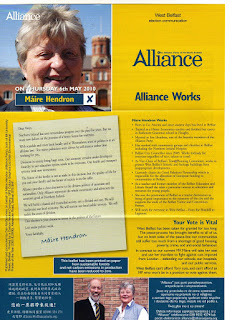 And who is their candidate Maire Hendron. Who? I mean did she ever visit this constituency. 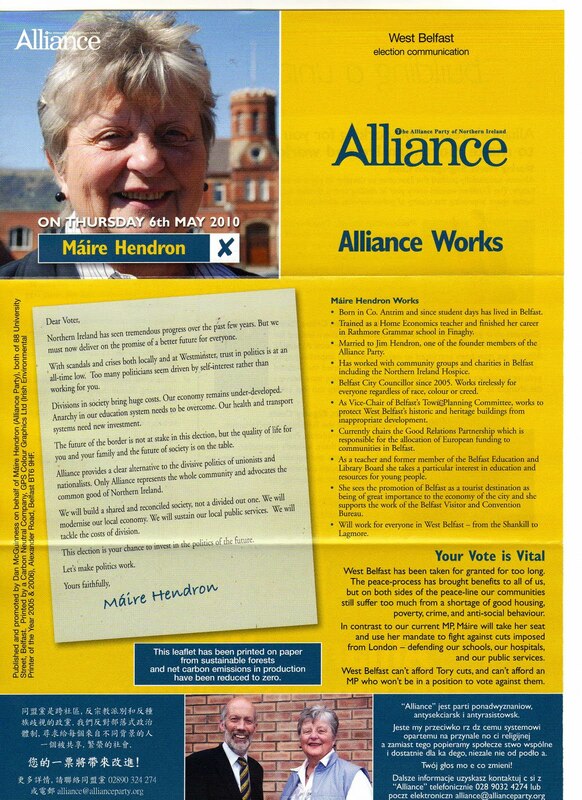 I know that Joe Hendron, who used to be my doctor stood and held the seat for a while and had a great following in this constituency, but he was in the SDLP, not Alliance, so if Maire is hoping to trade on the family name she is going to be severely disappointed. This is one outcome that can safely be predicted. Infact she is so unknown of in this constituency I'm sure people will wonder who she is on their ballot paper!!! created by Kateyo at approximately 3:49 AM Categories Belfast. Writers. election. You better get her name right! Máire Hendron is a councillor over in the east of the city. Guess Alliance wanted to put up candidates in all constituencies, but found it hard to find locals willing to stand in some of them! Thanks Alan, I've changed it now.